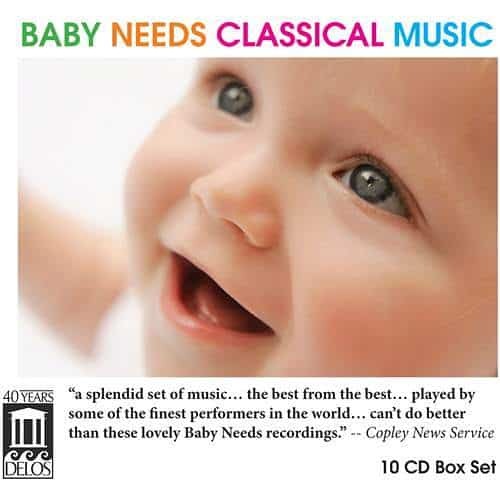 Delos’ highly acclaimed Baby Needs series consists of 10 CDs, for which the musical selections are lovingly chosen according to their potential appeal and developmental value to young listeners. Early exposure to the classics has proven to be an effective means of instilling in children a lifelong love of great music. We release the 10 CDs of the popular Baby Needs series as a complete box set to cap Delos’ 40th anniversary year, as well as to pay fond tribute to the legacy of our founder, psychologist Amelia Haygood. Under her guidance, the company has ever embodied her abiding concept of great music as an effective means of promoting the learning abilities as well as the artistic and aesthetic development of the very young. Each individual CD explores either the music of a different composer or a particular theme, hence the assorted titles: (“Baby Needs”) Mozart • Baroque • Lullabys • Guitar • Bach • More Mozart • Brahms • Beethoven • Papa Haydn • Beauty.